Workers at the Lihir gold mine in Papua New Guinea walked out five days ago over a pay dispute in an unofficial action that is still unresolved. Efforts to cut a deal have stalled while managers consider Lihir's workers' demands, which include sacking the entire management of the mine. It is claimed that workers have been consistently denied the right to organise to protect their rights at work. Miners were also concerned that management would renege on commitments to raise their wages and improve working conditions. A number of workers took direct action last week, moving heavy machinery to block entrances to the mine and suspend production. Mining bosses and government officials branded the action "illegal" after miners failed to register their complaint through the proper legal channels, but the entire workforce of 3,500 are out. Armed police were flown in from Port Moresby and high-level government delegations are said to be attending the site. 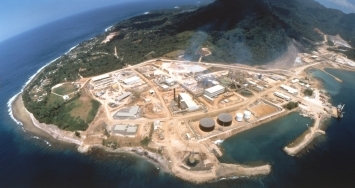 According to Pacific Magazine's website, workers have now formed their own organisation, the Lihir Gold Allied Workers Union, as a means of co-ordinating demands. The Lihir open-pit gold mine is one of the region’s biggest commercial projects. About A$1.2bn (about US$1bn) in commercial bank financing has been raised for the scheme, which will produce 1m oz of gold per year. Investment banks Goldman Sachs and Australia’s Macquarie Bank underwrote the funding. The four-day stoppage has cost parent company Lihir Gold an estimated US$6m in losses. According to Reuters newswires, the strike had “jolted” the world’s gold markets, causing the price of gold to drop by US$2 per ounce last Friday. Mine workers now hope that the massive disruption caused means that management will fulfill their verbal commitments to raise salaries and improve conditions. The Lihir mine is one of the world’s richest gold production sites, but has come under severe criticism from locals. A blast earlier this summer was said to be responsible for the death of a child and over the past few years there have been numerous fatal accidents involving workers. According to the Mineral Policy Institute, over 98m tonnes of cyanide-contaminated “tailings” (waste by-products from processed gold ore) and 300m tonnes of waste rock will be dumped into the ocean over Lihir's projected 36-year lifetime . The strike continues into its sixth day.